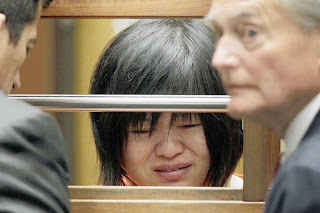 Home » Blog » Dr. Tseng Sheds Tears – Give me a break. Dr. Tseng Sheds Tears – Give me a break. Dr. Lisa Tseng, Roland Heights, CA – weeps at her arraignment hearing in Los Angeles on March 15, 2012. Judge denied bail. She is charged with second degree murder for 3 young men. Charges for several other deaths are pending. Dr. Lisa Teng Shed Tears. There are three confirmed deaths due to her reckless prescribing of addicting drugs such as OxyContin, Opana, Xanax, and more. She told a parent – face to face – that it’s not her problem. She can’t control how the medication is taken after she prescribes these drugs. Dr. Tseng has written over 27,000 prescriptions in the past three years. She maintains that she is not guilty. Shed your tears Dr. Tseng. Sorry your life has been turned upside down. in a cement cell with iron bars? prescribe pills – because you could. of your swift and mighty pen? the wrath of your actions.